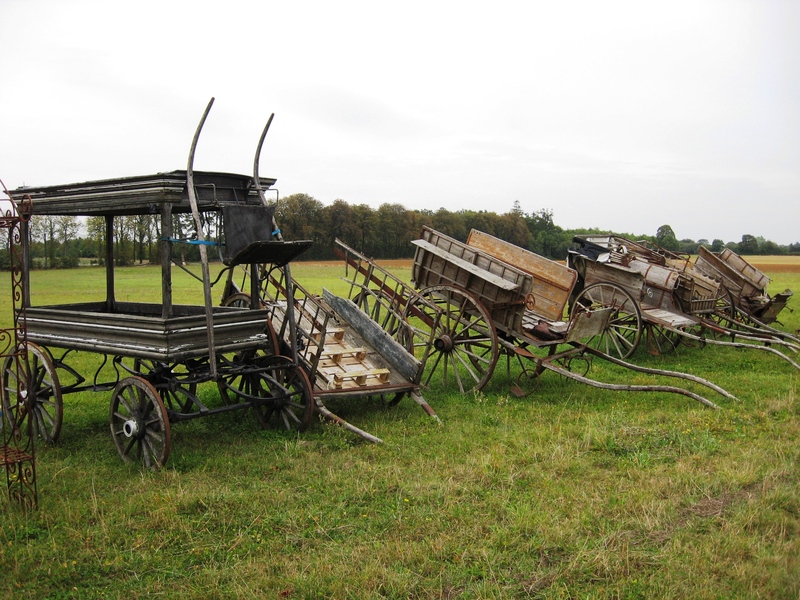 As we slip into the cooler days of a southern Normandy autumn and there is less work to do in the garden, we have been nosing around brocantes and antique shops near Alençon. 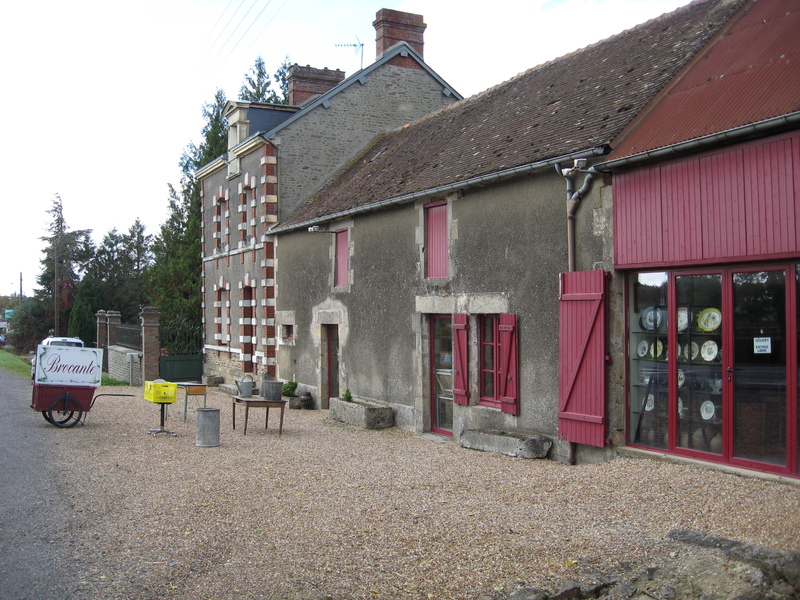 Earlier this year we focussed on the brocantes of the Perche region to our immediate east, so for a change we decided to look up a few addresses around Alençon to the west. 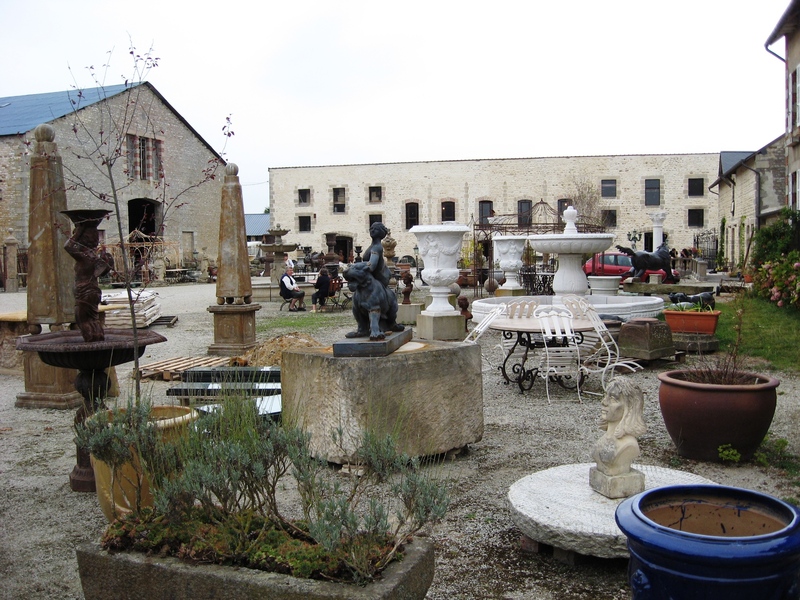 We’ve mentioned the amazing “Esprit Antiques” brocante and reclamation yard in a recent blog post, and this inspired us to dig out a few more – so here are a three more that we visited recently. 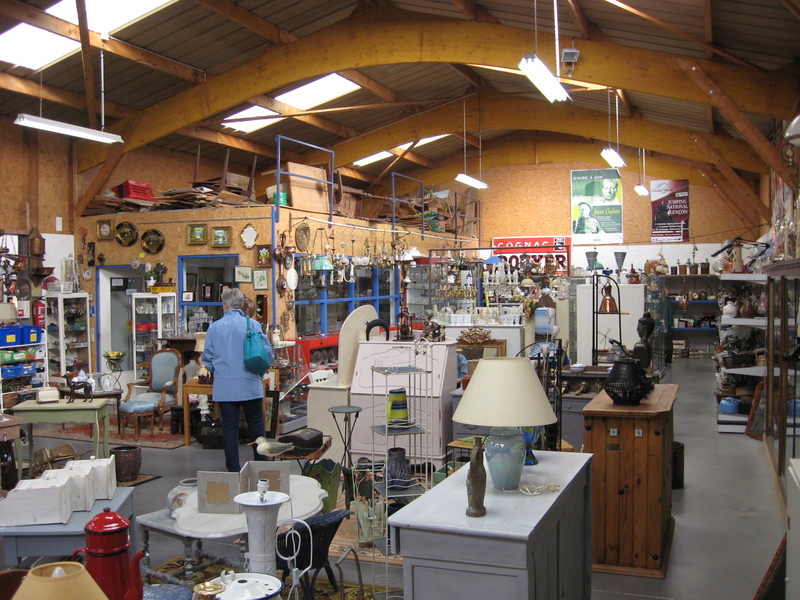 This large brocante and depot-vente occupies a hangar of 680m² split into two sections. 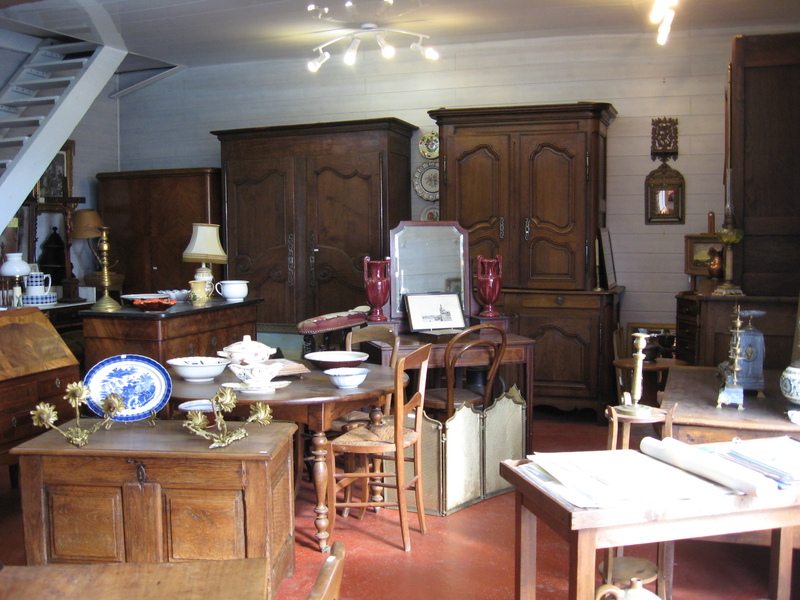 The first is mainly wooden furniture with a little section for garden tools and hardware; lots of tables, chairs, wardrobes – some of it is relatively modern but mostly antique – the condition and quality are variable. 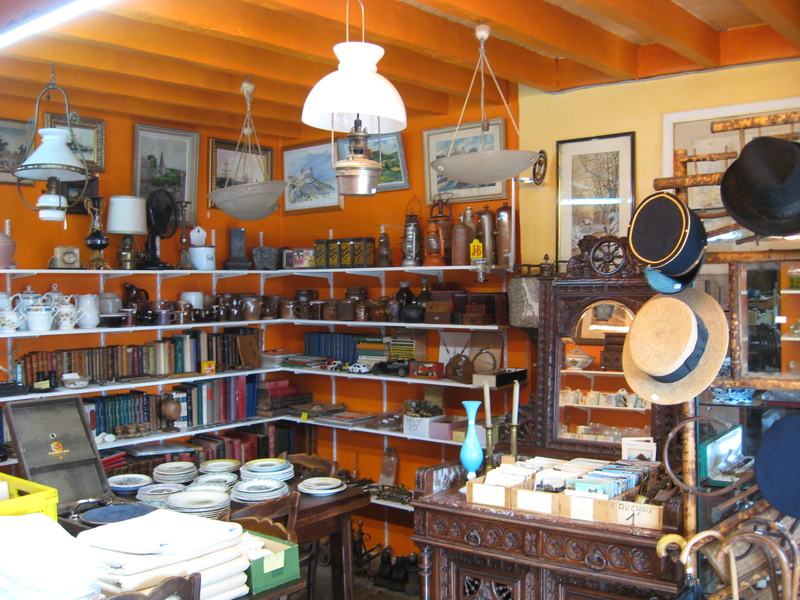 The second room is packed with smaller furniture like occasional tables, bedside tables and painted cabinets, plus a large selection of glassware and china, pottery, lamps and lighting. We’ve been here many times before and they have recently improved their presentation, which used to be frankly chaotic, with boxes full of tut all over the place, so that you couldn’t see the wood for the trees – it is much, much better now. This time when we visited there were some reasonable marble topped bedside cabinets (“chevets”) from 25€ and a couple of nice church pews for about 75€. Open 7 days a week. Mon-Fri 10h00 to 12h00 and 14h00 to 19h00, Saturday 10h00 to 19h00, Sunday and holidays 15h00 to 19h00. 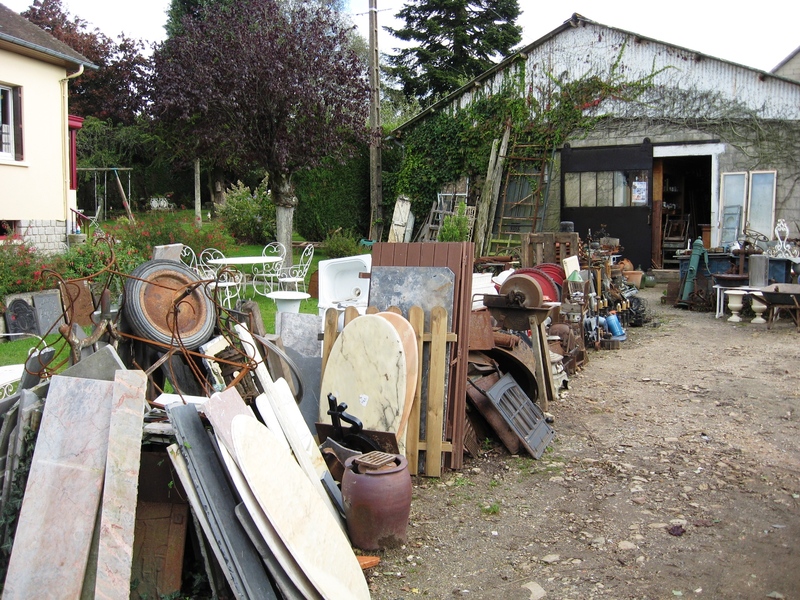 This brocante and scrapyard is great for nosing around for old iron fire guards, fencing, gates and grills, old farm and carpentry tools, metal urns, chairs and benches. The yard is haphazard and in the shed containing furniture, china and knick-knacks you have to watch you don’t bring piles of stuff tumbling down around your ears, but the prices are good and it’s just the sort of place where those with an inventive turn of mind who like to “re-purpose” old objects can unearth a bargain buried in a corner or hidden under something else. The owner is very friendly and will leave you to nose around undisturbed, but is happy to help and is open to bargaining over prices. 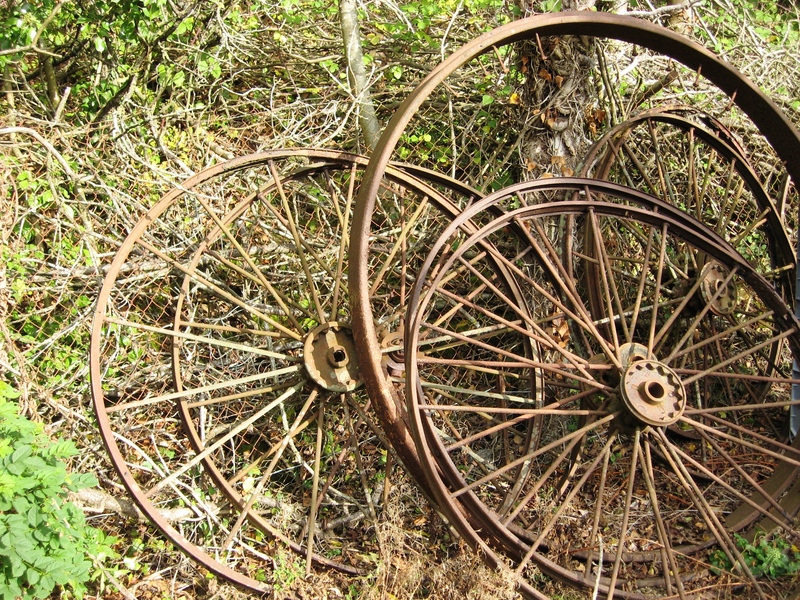 On the other side of the house is the scrapyard where we found loads of old ploughs and cart wheels – as well as huge piles of scrap metal whose purpose we couldn’t fathom out. 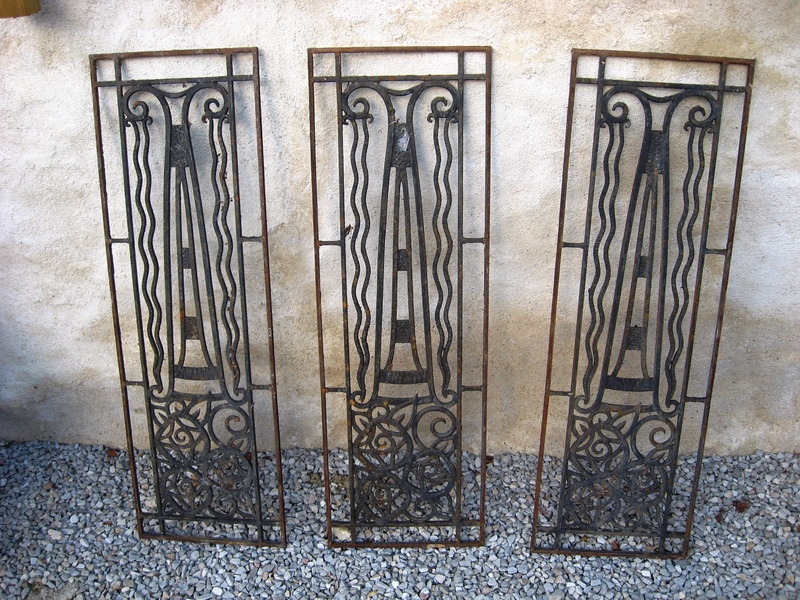 We bought a nice painted iron bench (no age, but attractive) and three large decorative metal grills for the garden. 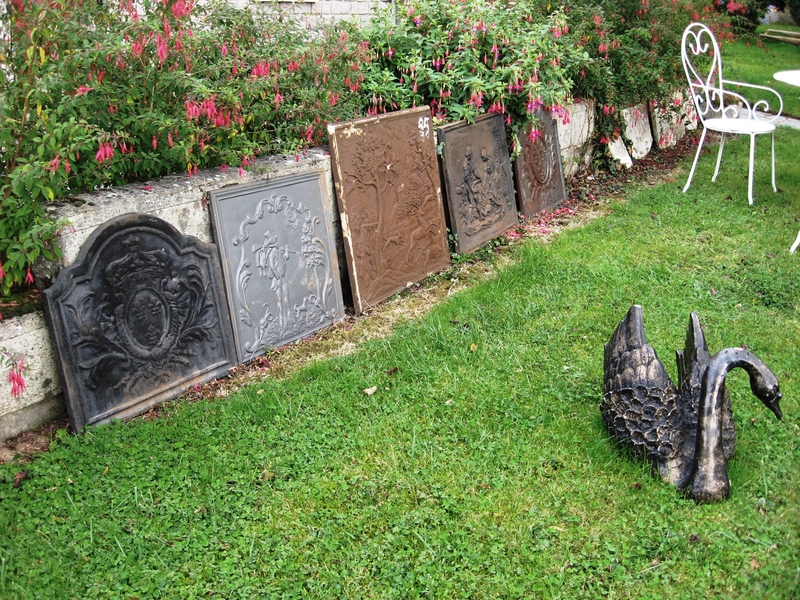 We plan to return to buy one or two old sewing machine stands (he had loads for 15€ each) and some marble tops to place on them (10€ each) and use as display tables in the garden. Open every afternoon except Sunday. 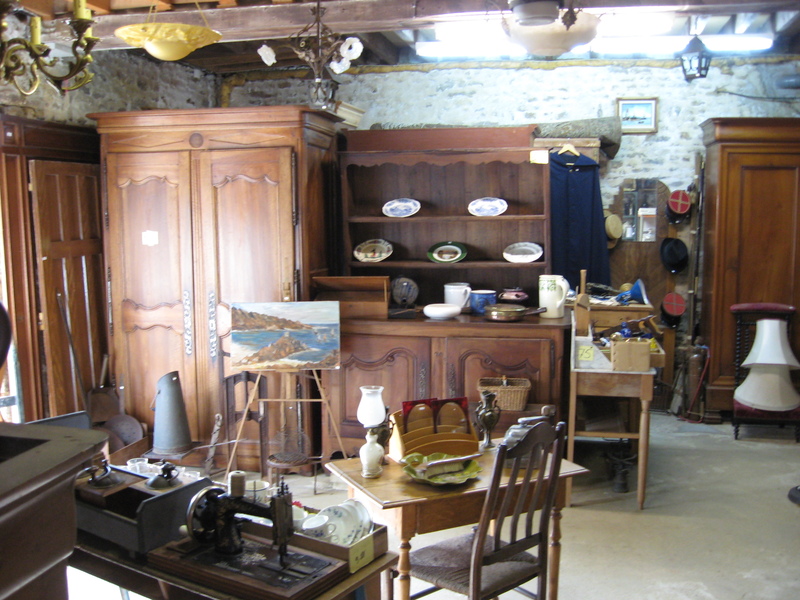 A small roadside brocante with an eclectic mix of books, paintings, furniture large and small with the bonus that the furniture seems to be reasonably priced, so maybe less haggling required! The lady who was in charge when we visited was very pleasant and there was no feeling that we were being watched, no pressure and no questions about what we were looking for – we were free to wander. 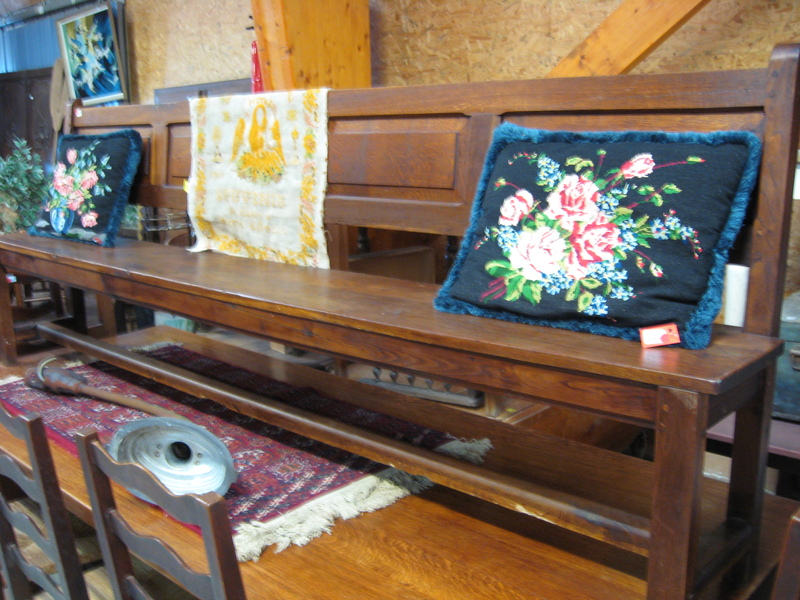 There is an additional small showroom upstairs. 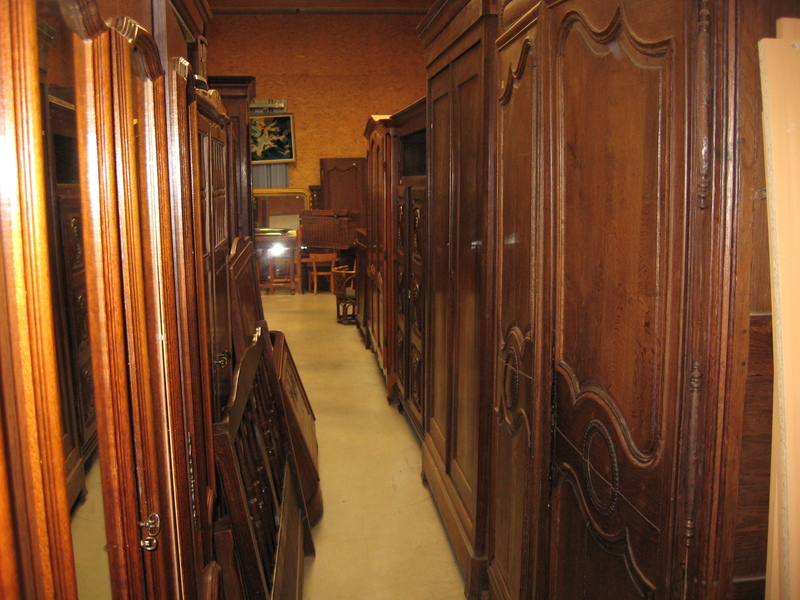 We were particularly taken by the selection of traditional wardrobes, from 350€ to 500€. 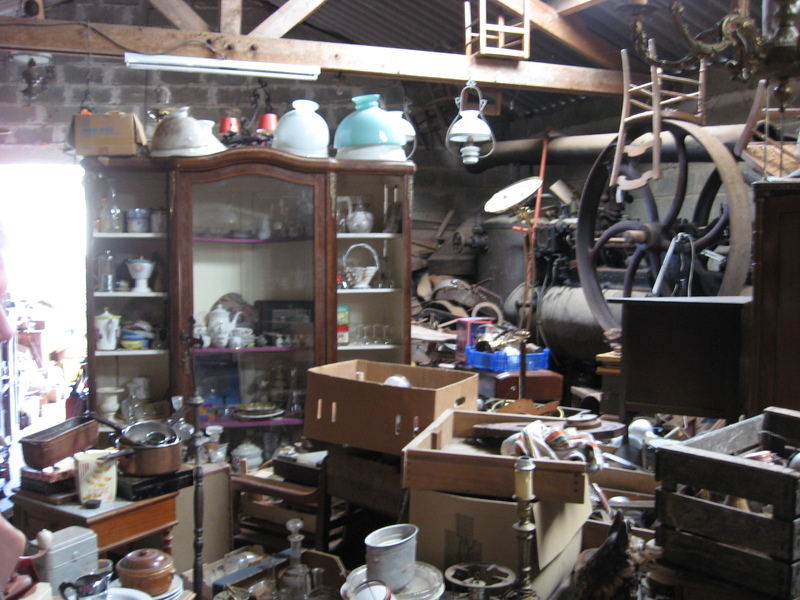 Not pieces of exceptional quality (they run to thousands – if you’re looking for that kind of spending we can give you other addresses) but attractive with some age, a bit of style and in good condition. 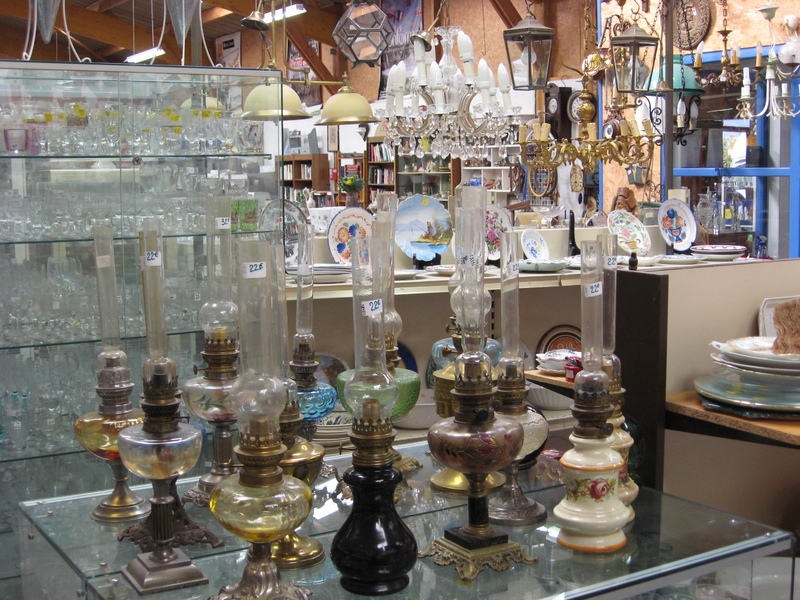 First Saturday of every month on the pavements surrounding the Halle au Blé, Alençon, there is a flea market which draws many brocantes on a regular basis – postcards, peppermills, lighting, furniture, books and paintings. The Halle au Blé is one of the landmark buildings in Alençon town centre; park up for free in the Palais de Justice car park about 50m away; the stallholders are all around the impressive, glass-domed, circular building that used to be the corn exchange. 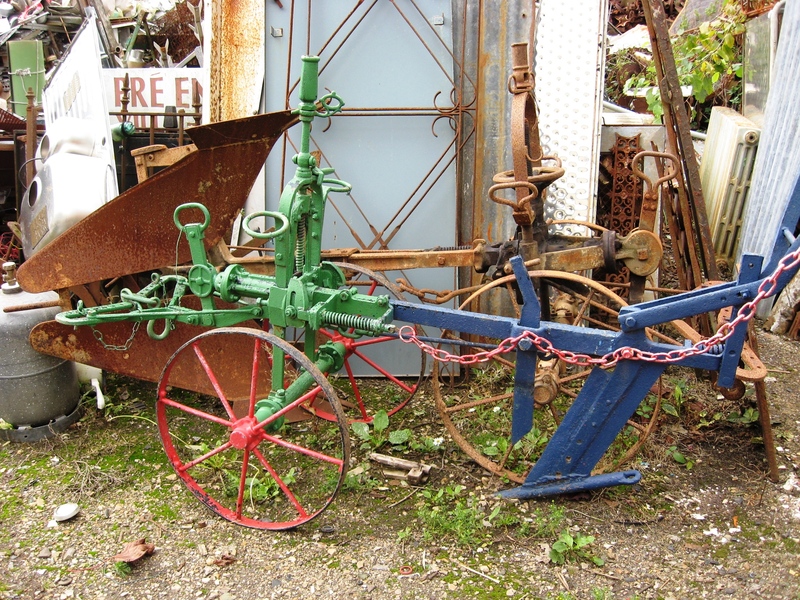 Am loving perusing your blog – we are hoping to visit Normandy the last week of September, I wonder if you could recommend (or point me in the direction of a site that does) Brocantes, etc in/near Eure? The Eure is a department in Upper Normandy and TBH I don’t know about shopping there, as I’m only familiar with a few gardens and tourist sites – why don’t you contact the Tourist Office in Rouen? Rouen is on the southern border of the Eure whilst we’re on the border of Lower Normandy and the Pays de la Loire, well to the south.